It’s taken us years to refine our systems and processes. Now, we’re sharing our highly successful and proven methods that we currently use for our own clients with you. Learn how to get leads the way Linkedin wants; by using best practices with their native tools built right into their platform. 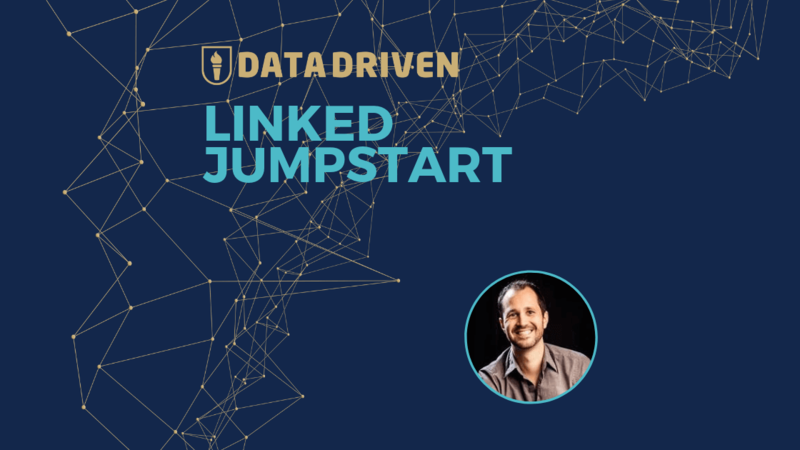 What you learn in Linked Jumpstart is evergreen. Learn how to think, not what to think. To help you get there we’ve included a number of downloadable resources including reporting templates and campaign calendars. +15,337 students already trust Data Driven. That’s why we’ve partnered exclusively with them for Linked Jumpstart’s online learning dashboard. We want what’s best for you. We’ve used Linkedin to generate millions of dollars in B2B sales for our clients. Now, we’re sharing our proven methods that have taken years to refine. Here’s a secret the best B2B salesmen keep under lock and key. B2B sales always start with a P2P (person-to-person) relationship. Has the constant talk about “inbound marketing” this past decade made you forget, “it’s all who you know?” What you’ll learn in this course isn’t a gimmick. It’s evergreen. If your business is going to be successful you need to have the right relationships, with the right people, at the right companies. See what an organic Linkedin campaign looks like starting with market research and ending with a conversion to sales funnel. All in just 15 minutes. Create a campaign calendar so you can constantly hit your lead generation KPI’s and goals each month. We’ll examine the risks and benefits of using automation on Linkedin. We’ll also cover the official TOS. Map out your conversations so you’re prepared for every objection and to move conversations forward. There are spoken and unspoken rules of engagement when scripting messages on Linkedin. Do you know what they are? How to write message sequences that get your connections to self diagnose and tell you where they’re at in the sales cycle so you don’t have to guess. Learn which Key Performance Indicators you should be tracking, how to do it, and the numbers you should aim for. You won’t find this on Linkedin. Use our reporting template to create high quality reports on KPI’s that actually matter. Catch negative trends before they become a problem as you compare performance month by month. Learn how to use KPI reporting to make data driven campaign optimization decisions. Discover how to spot and correct weaknesses in your outreach and what list decay is. Maximize your time and make your efforts go farther by discovering who your Linkedin money clients are before outreach. Learn about different connection personas and how each can be a profitable asset for your business. Avoid one of THE most common reasons people fail at using Linkedin for lead generation. Get inside the mind of your clients to prepare for relevant market research, profile optimization, and conversation sequencing. See what’s possible on Linkedin search and learn how to master it to make sure every conversation is worth having. Learn what boolean is, what it does in search, and how to use it to give you better search results. I’ll give you real time examples of using boolean in search to get a good list. Learn how to use advanced search to perform real time market research for decisions about product launch locations, physical property purchases, dividing sales territories, and so much more. Learn two different lead generation strategies, why both work, and how they fundamentally affect your profile optimization strategy. All the profile sections you can add to your profile and their value on Linkedin. How to make your profile ultra-relevant to your outreach group when prospecting. Cut through the fluff and learn about what really matters when optimizing your Linkedin profile.